On Friday, 7 December, the Department of International Development hosted the last lecture of the term for its Cutting Edge Issues in International Development lecture series. 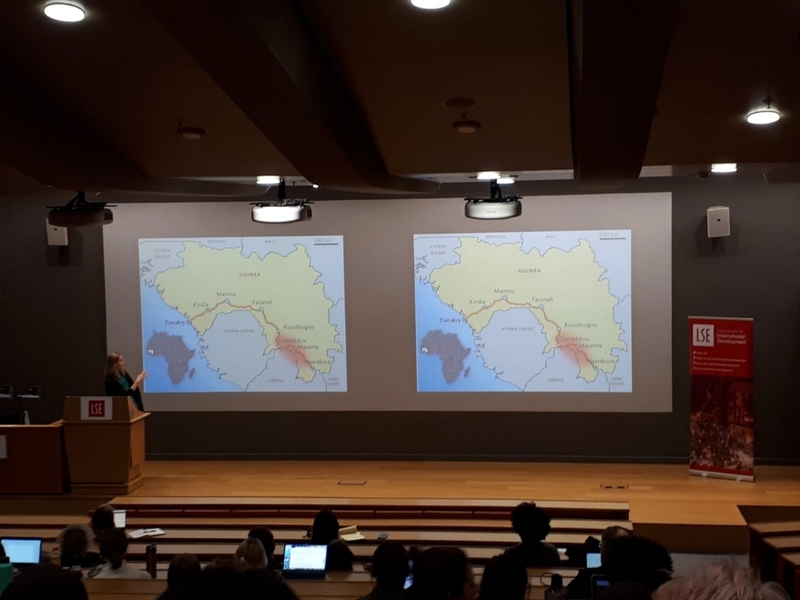 Guest speaker was Prof Melissa Parker of the London School of Hygiene and Tropical Medicine, and she gave a compelling talk on the Ebola crisis in Sierra Leone and the Democratic Republic of Congo (DRC). Read about her lecture here. Context should never be underestimated. I remember when I heard the news about the Ebola outbreak – the media news outlets non-stop reported on the highly infectious and deadly disease that made its way through West Africa. As someone who has lived in Kenya during the outbreak, this topic was very interesting to me. Friends and acquaintances who lived in Europe at the time seemed to be much more concerned about the outbreak than myself, simply because of what they heard on the news. The power of the media is not to be underestimated as most people rely on information that mainstream news outlets provide to them, without gaining the deeper insights as to what is actually happening on the ground – without the context. Therefore, it was very refreshing to hear Prof Parker’s insights on how she experienced the Ebola outbreak as she shared her personal experience of working with communities in Sierra Leone and the DRC. She outlined that combatting the crisis isn’t simply a matter of providing health care facilities and health workers on sites, but that it is a much more complex issue within a broader political and historical context. Colonial legacies often manifested in civil wars created a large distrust between societies and their governments – which, in times of crises, led people to seek support within their respective communities as opposed to their government. Public health care facilities are thus avoided by the population, simply because of the belief that the government does not have the best interests of its people at heart. Another talking point that Prof Parker raised was the role that international organizations played during the epidemic. The consensus within the international community was that the World Health Organization (WHO) had responded rather poorly, which led the UN Security Council to create the UN’s first ever health mission, the United Nations Mission for Ebola Emergency Response (UNMEER) with the aim to provide a faster and more coordinated response effort. Furthermore, Prof Parker stressed the complicated working relationship between governments and international organizations, as one cannot work without the other. The WHO for example works with governments to effectively provide responses; but how can the government provide any assistance if they are alienated by the population? These among many other complex issues, she says, need to be considered when aiming to provide responses to epidemics. Bottom line: Dealing with complex disease outbreaks such as Ebola requires careful consideration of socio-political contexts and cultural attitudes. It requires a greater degree of international coordination and leadership. International organizations as well as governments need to find more effective ways to work together by understanding moral norms and social values of smaller communities as well as the population at large. On Friday, 18 January 2019, we’ll be back with the lecture series: We’ve got some exciting lectures coming up in Lent Term – guest speakers include Danny Sriskandarajah, Kevin Watkins, Laura Kelly and Rafeef Ziadah, among many others. Have a look at the full schedule here.